It was a pretty chaotic racing weekend at Symmons Plains Raceway. 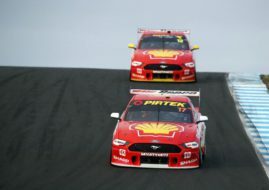 The V8 Supercars Championship’s Tyrepower Tasmania SuperSprint is marked by a 12-car pile-up in Saturday’s race and incident packed Sunday’s race in which Fabian Coulthard led the 1-2 victory for DJR Team Penske/Shell V-Power Racing ahead of team-mate Scott McLaughlin. The opening race at Symmons Plains lasted for just one and a half lap before a 12-car accident triggered a red flag period. Fifty minutes later, the race was restarted behind the Safety Car for one more lap and Shane van Gisbergen was declared winner but officials decided not to award points. Before the accident, Chaz Mostert made the best start from P2 to lead the opening lap before running off at Turn 2 on lap two, handing the lead to Van Gisbergen. A chaos on the wet track with limited visibility happened on the straight before famous Symmons Plains hairpin. After an initial contact between Fabian Coulthard and Rick Kelly, chain reaction caused wreckage behind their back. Garth Tander, Tim Slade, Nick Percat, Tim Blanchard, James Moffat, Scott Pye, James Courtney, Alex Rullo, Will Davison, Taz Douglas and Simona De Silvestro were involved in the carnage. Fortunately, no one was badly hurt. Will Davison was taken to hospital for tests complaining of lower back pain. Four cars have been ruled out of Sunday’s race. The cars of Will Davison (Tekno Autosports), Rick Kelly (Nissan Motorsport), James Courtney (Mobil 1 HSV Racing) and Taz Douglas (Lucas Dumbrell Motorsport) have all been declared too heavily damaged to be repaired at the circuit. 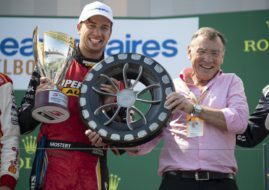 In the second race, Fabian Coulthard and Scott McLaughlin continued winning form from non-championship weekend at Melbourne’s Albert Park, where they won three out of four races. At Symmons Plains, Coulthard took his first win of the season and sixth V8SC win in a career. Like in the first race, Chaz Mostert had the best start, jumping from third to first, but he again made an unforced error on lap 58 and dropped out of the lead. At the end, Mostert was seventh. Jamie Whincup climbed to the third spot on a podium, followed by Craig Lowndes, David Reynolds and Cameron Waters. A series of Safety Car intervention ensured the race reached its time cut-off so it was shortened from scheduled 84 to 76 laps. After three Adelaide’s races and one race in Tasmania, Shane van Gisbergen now holds a 20-point championship lead over Coulthard, with Whincup a further 31 points behind.